That laws nor sacred rites neglect. HRIMTHURSAR, a nation of one-eyed inhabitants; this is said of them because they are great marksmen and shut one eye when they take aim; they dwelt in the East. "Long will the third a race," --- This means the inhabitants of Southern regions. In war; and under the third dwell learned men. 24-29. Three roots stretch three ways under the ash Ygg's-steed. Hell dwells under one, the Frost Giants under the second, mortal men under the third. and human kind 'neath the third. ‘Neath the last are the lands of men. 'neath the third; Mithgarth's men. human men under the third. under the third the men of mankind. the third the human race. Grímnismál 31 provides us with the clearest, and therefore the most important, account of the world-tree’s roots in all of Eddic poetry. 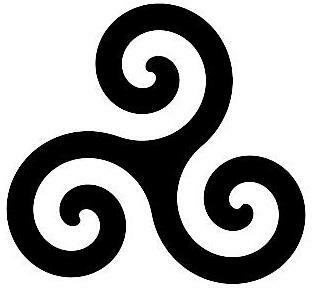 It says that three roots stand on three ways beneath the tree. Then locates each root with a specific being or beings. Beneath one lives Hel, beneath a second live frost-giants (hrimthursar), and beneath a third dwell "human men" (mennskir menn). Like many Eddic verses of this type, the information it contains, while mythically accurate, is not immediately transparent. The poet cloaks the information in seemingly plain, but nonetheless allusive, language, creating a riddle for his intended audience. It is our task to decipher the meaning. The natural inclination, of course, is to interpret the verse literally. For the most part, scholars who have commented on this verse have interpreted the location of the three roots literally, placing one root in underworld (the one with Hel), one root in Jötunheim (the second with frost-giants), and one root on Midgard (the third with human men), and still profess as accurate the vertical orientation of the roots described by Snorri Sturluson in the Prose Edda (i.e. one root in heaven, one root in Jötunheim, and one root in Hel). However, upon reflection, this approach, presents irreconcilable logical problems. If we accept the vertical orientation described by Snorri, and interpret Grímnismál 31 literally, as described above, then we notice that, according to Snorri, no root in fact extends to Midgard, the home of "human men." In Snorri's description, the three roots run to the lower world (Niflhel), to Jötunheim and to heaven. "Óðinn’s focus broadens now from a close focus on the ‘sacred land’ out into an inclusive view of the universe, situating the realm of death, of frost-giants, and of humans below the central point of the divine land, Yggdrasill. The gods now seem to exist above humans, not contiguous with them. "Elsewhere the gods and giants certainly seem to exist on the same horizontal plane, as in the geography of Hárbarðsljóð, for example, but since the gods interact so little with human it is difficult to evidence a consistent spatial dimension when the gods journey to humankind." Indeed, it is difficult when one takes this approach. Larrington states that the "horizontal plane has been mapped in the catalogue of the gods’ dwellings", yet upon examining Grímnismál 5-17, we find that the halls it contains are not confined to the horizontal plane. Some are qute obviously located on the vertical plane, such as Valhall, which is best located above Midgard in heaven. For example, the heathen poet of Sonnatorrek, Egil Skallagrimson, places Valhall "upp í Gódheim" and in Eiriksmál, fallen heroes arrive in Valhall over Bifröst. The same goes for Alfheim, Briedablik and Glitnir which Snorri places in heaven in Gylfaginning 15, and Njörd's hall, Nóatun ('Shipyard') which Snorri assures us is "in heaven" but which must be located on the sea, since his new bride Skadi cannot stand the cry of seabirds there. Thus an interpretation, such as Larrington's, which sees the catalogues of divine homes as purely horizontal is difficult to accept. Similarly, an interpretation which holds that the orientation of Yggdrasil's roots outlined in Grímnismál 31 is vertical, as Larrington professes, is problematic. 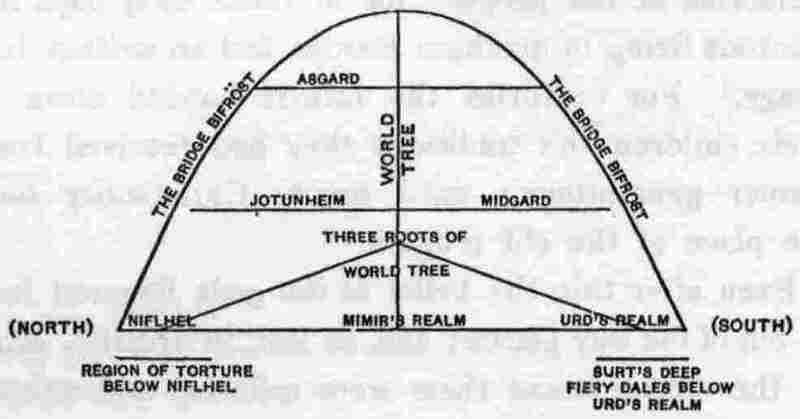 A vertical interpretion of the verse would place one root in the underworld (with Hel), one root in Jötunheim (with frost-giants) and one root in Midgard (with "human men"). If we read the verse literally, we fail to find a root in heaven, as Snorri states. Thus, unless we postulate a fourth root, something we have no evidence for, we must conclude that either the statements made by Snorri Sturluson or those of the heathen poet responsible for Grímnismál are in err. Remarkably, even Larrington herself expresses some doubt about this conclusion, stating that 'The gods now seem to exist above humans, not contiguous with them," admiting "it is difficult to evidence a consistent spatial dimension when the gods journey to humankind." Unfortunately, she does not expound on her reasons for this view. These problems, however, are not insurmountable. By actually comparing the two sources side by side, we see that difficulty arises in accepting Snorri's statements regarding Old Norse cosmology as mythically accurate, and then insisting on a literal reading of the old heathen poems. For too long, and without sufficient reflection, Snorri’s statements regarding the position of Yggdrasil's roots have been used to interpret the older Eddic poems. Yet an objective look at Snorri's statements regarding Old Norse cosmology demonstrates that the bulk of his information has been derived from Eddic poems, such as Grímnismál, Völuspá and Vafþrúðnismál. He often cites verses from these poems to support his statements. Thus, we expect them to agree. Yet, all too often, they don't. is the best of trees..."
ok undir þeiri rót er Hvergelmir, en Níðhöggr gnagar neðan rótina. "...from his horns, liquid drops into Hvergelmir." "...and Nidhögg rends it below"
understand ye yet, or what?" Understand ye yet, or what? Þá mælti Gangleri: "Brenn eldr yfir Bifröst?" Hárr segir: "Þat, er þú sér rautt í boganum, er eldr brennandi. Upp á himin mundu ganga hrímþursar ok bergrisar, ef öllum væri fært á Bifröst, þeim er fara vilja. and the holy waters glow. Then said Gangleri: "Does fire burn over Bifröst?" Hárr replied: "That which thou seest to be red in the bow is burning fire; the Hill-Giants might go up to heaven, if passage on Bifröst were open to all those who would cross. There are many fair places in heaven, and over everything there a godlike watch is kept. A hall stands there, fair, under the ash by the well, and out of that hall come three maids, who are called thus: Urdr, Verdandi, Skuld; these maids determine the period of men's lives: we call them Norns; etc. This passage from Gylfaginning 15 forms the basis of Snorri’s take on Old Norse cosmology, and has been used as the model on which our modern ideas concerning Old Norse cosmology have developed. Yet as we shall see, modern ideas regarding Old Norse cosmology do not fully agree with Snorri's statements or those of the Poetic Edda. Instead, they are a hybrid of both. Because few study the matter, it generally passes unnoticed. As shown, Snorri places Yggdrasil's three roots on a vertical axis running from the underworld to heaven. In addition, he places one root near each of the three wells mentioned in the poetic sources: Urd's well, Mimir's well and Hvergelmir. Each well supports one root of the world-tree. Since we can confirm this in Eddic poetry, there is no reason to doubt that this one-to-one correspondence between Yggdrasil's three roots and the three wells is mythically correct. In support of this, we note that Grímnismál makes reference to each of these three wells in the verses immediately preceding the placement of the roots in Grímnismál 31: Hvergelmir is called by name in verse 26; Mimir's grove, Hoddmimis holt, is alluded to in the expression hodd goða 'the hoard of the gods" in Grímnismál 27, (which, along with verse 28 could be considered a single stanza, if the verse has been interpolated with additional river names as many scholars have suggested), and verses 29 and 30 speak of Urd's well and its holy waters. Therefore, we can conclude that an accurate account of the old Heathen cosmology places each one of these three mythic wells near one of Yggdrasil's three roots. Since the sources are unusually clear on this matter, there is no good reason to postulate additional roots and wells (something we have no evidence for) or reduce the three roots and wells into a single root and well, as Paul Bauschatz writing in 'The Well and the Tree' (1982) proposed. 1. Hvergelmir located in Niflheim: Gylfaginning 15: "the third stands over Niflheim, and under that root is Hvergelmir, and Nídhöggr gnaws the root from below." Gylfaginning 4: "Many ages before earth was created, Niflheim was made, and in its midst lies a spring called Hvergelmir, and from it flow the rivers called Svöll, Gunnþra, Fjörm, Fimbulþulr, Sliðr and Hrið, Sylg and Ylg, Við, Leiptr; Gjöll is nearest to the Hel-gates." Gylfaginning 5: "From Niflheim there arose coldness and all things grim..."
2. 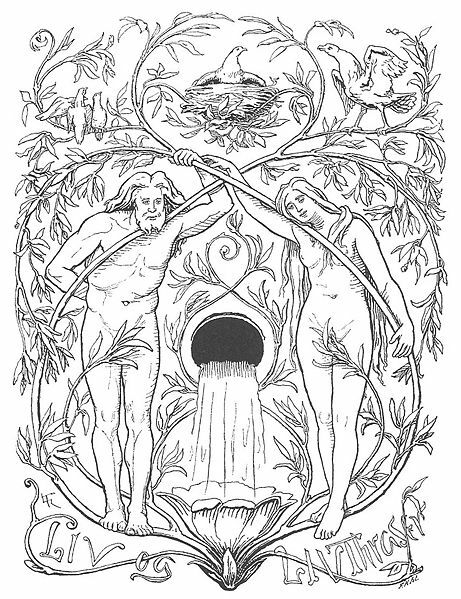 Mimir's well located in Jötunheim: Gylfaginning 15: "under that root which turns toward the frost-giants is Mímir's Well"
Gylfaginning 15: "the second [root] is among the frost-giants, where Ginnungagap once was." 3. Urd's well in heaven, visited by the human Æsir: Prologue to Gylfaginning, ch. 3: "Near the middle of the world was constructed that building and dwelling which has been called the most spelndid ever, which was called Troy. We call that land there Turkey. ...The name of one king there was Munon or Mennon. he was married to the daughter of high king Priam; she was called Troan. They had a son, he was called Tror, we call him Thor. [After many generations of descendants...], he had a son whose name was Wodan, it is him that we call Odin." Prologue to Gylfaginning, ch. 4: "Odin went north to what is now called Sweden. ...Odin found the conditions of that country favorable and selected as a site for his city the place which is now called Sigtunr. He organized rulers there on the same pattern as had been in Troy." Gylfaginning 14: "This was the place called Idavoll in the center of the city. It was their first act to build the temple that their thrones stand in, twelve in addition to the throne that belongs to All-father. This building is the best that is on earth." Gylfaginning 13: "Have you not heard that the Aesir built a bridge to heaven from earth called Bifröst?" Gylfaginning 15: "The third root of the Ash stands in heaven; and under that root is the well which is very holy, that is called the Well of Urdr; there the gods hold their tribunal. Each day the Æsir ride up there over Bifröst, which is also called the Æsir's Bridge." Gylfaginning 15: "There are many fair places in heaven, and over everything there a godlike watch is kept. A hall stands there, fair, under the ash by the well, and out of that hall come three maids, who are called thus: Urdr, Verdandi, Skuld." Gylfaginning 16: Gangleri spoke: "You are able to give a great deal of information about the heavens. What other chief centers are there besides Urd's well?" High said: "Many splendid places are there. There is one place called Alfheim; there live the folks called light-elves ...One place is called Briedablik, ...And there is one called glitnir, ...also a place called Himinbjorg, it stands at the edge of heaven at the bridge's end where Bifrost reaches heaven. There is also a great place called Valaskjalf. This place is Odin's." Gylfaginning 54: "The Aesir ...assigned those same names that were mentioned above to the people and places that were there [in Sweden], so that when long periods of time had passed men should doubt that they were all the same. ...So someone was given the name Thor —and this means the ancient Thor of the Aesir, that is Oku-Thor— and to him are attributed the exploits which Thor (Hec-Tor) performed in Troy." Without drawing any conclusions on the accuracy of Snorri’s text as a whole, a literal reading of the unabridged text gives us good reason to believe that the Prose Edda contains a mixture of genuine heathen ideas interlaced with Roman Catholic traditions accepted as factual history. When we consider that Snorri wrote his Edda more than 200 years after the Christian conversion of Iceland, we have little reason to doubt that he himself accepted Church history as factual. Thus it seems foolish to simply strike out the obviously borrowed foriegn material and accept the remainder of the text as an accurate reflection of old Heathen beliefs. Yet, this has been the common approach to the material for the last two centuries. This method is deeply engrained in modern scholarship. As a result, scholars have unquestionably placed the roots of Yggdrasill along a vertical axis, as Snorri did. if we wish to remain objective, at the very least, we should question how the foreign material imported into and layered over the Old Norse mythology effected Snorri's understanding of it, especially as it relates to his concept of the Old Norse cosmology. Can it simply be struck through and ignored, or is it an intregal part of the text? Do the mythic sources make a distinction between Hel and Niflhel ('Misty-Hel')? Although Mimir is designated as a jötun, is he in fact a frost-giant (Hrímþurs)? Would a heathen poet ever refer to the Æsir as mennskir menn, "mortal men"? As we saw in the previous two verses, a genuine heathen understanding of Grímnismál 29 and 30, leads us to believe that Asgard is located on one side of the Bifröst bridge and that Urd’s well is located on the other. In agreement with this, Snorri consistently portrays the Aesir as human men from Asia who built a bridge to the sky and established a thingstead there. Clearly, he interprets Grímnismál 29-30 to mean that the human Aesir ride upwards daily to reach Urd's well in heaven. As evidence of this, he actually uses the word upp in Gylfaginning 15. In Snorri's account, Bifröst is depicted as a bridge leading from the city of Troy (the home of the human Aesir) upwards to Urd’s well in the heavens. As a result, Bifröst is most often understood as a bridge leading from earth to heaven in modern mythological texts. However, the skaldic poem Sonatorrek composed by a known heathen poet, Egil Skalagrimsson, contradicts this, clearly stating that the home of the gods is located above the earth (upp í Goðheim), not on the face of the earth. So only one of these statements can be correct. Either Asgard is an earthly city, or it is located in the heavens. The home of the gods and Urd's well cannot both be located in heaven, and still on opposite ends of the Bifröst bridge. Yet today, many people place both Asgard and Urd's well in heaven, and still hold that Bifröst connects heaven and earth. Despite the fact that this view finds no support in the older heathen poetry, or in Snorri's Edda. The map of the Old Norse universe which accompanies Kevin Crossley-Holland's The Norse Myths (1980) best expresses this view. Note that the map places both Asgard and Urd's well in heaven, yet depicts Bifröst as a bridge leading from heaven to earth, directly contradicting both Grímnismál 29-30 and Gylfaginning 16! from Kevin Crossley-Holland's The Norse Myths 1980. Before investigating what the sources actually say, I would like to highlight some points of agreement between the Prose Edda and poetic passages which may aid us in our understanding of the placement of the roots and the wells that support them. Gylfaginning 4: "Many ages before earth was created, Niflheim was made, and in its midst lies a spring called Hvergelmir." Gylfaginning 15: "the third [root] stands over Niflheim"
Gylfaginning 15: "under that root which turns toward the frost-giants is Mímir's Well"
Gylfaginning 4: "...But first there was the world in the southern region called Muspell. It was bright and hot." Gylfaginning 15: "under that root is the well which is very holy, that is called the Well of Urdr; there the gods hold their tribunal. Skáldskaparmál 65: "Early poets have referred to Christ in terms of Urd's well and Rome, as for example Eliif Gudrunarson [who said] '...He [Christ] is said to have his throne south at Urd's well.'" In Gylfaginning 4, Snorri places the well Hvergelmir to the north in Niflheim. From there, venomous streams flow south into a great abyss called Ginnungagap, where the primeval giant Ymir first arose. Although Snorri places Urd's well in heaven, he quotes a skaldic verse in Skáldskaparmál 65 composed by a heathen poet converted to Christianity, which says that Christ sits "south at Urd’s well", in other words, in the opposite direction from Niflheim. In addition, Snorri says that Mimir's well is located "where Ginnungagap once was." These locations for the three wells remind us of the creation story provided by Snorri in Gylfaginning. There, Snorri places a world of fire to the south which he calls Muspell or Muspelsheim. To the north, he places a world of ice called Niflheim, in which Hvergelmir occupies a central position. In contrast to the frigid waters of Hvergelmir, we gather that the waters of Urd's well are warm. In Gylfaginning 16, Snorri says that swan’s swim in it, and that the norns lave its healing mud on the Tree. Of interest to our investigation, Snorri's statements regarding the location of the three wells, thus form an exact parallel to the first conditions of creation, described by Snorri in the opening chapters of Gylfaginning. To the north, he says there was a world of ice called Niflheim. To the south, he says there was a world of fire, where the demon Surt makes his home. In between the two, yawns an empty abyss called Ginnungagap. Rivers originating in Hvergelmir flow out from Niflheim into Ginnungagap, forming layer upon layer, filling it in. When heat from the south met the ice floes from the north, life first formed in the great chasm between them. The three directions that the roots of Yggdrasil extend thus correspond to the three primeval spaces: Niflheim, Muspelheim and Ginnungagap. When we consider that the wells are owned by some of the oldest and the most powerful beings in the universe, who are not subject to the authority of the gods, this localization of the three wells begins to make sense. Urd controls the power of fate. She and her sisters personally tend to the world-tree, also called “the Measuring-Tree”, the "Tree of Fate" (mjötvið, Völuspá 2), laving it with healing mud from their spring (hár baðmr, ausinn hvíta auri); as a result the ash Yggdrasil "stands ever green over Urd's well," (stendr æ yfir grænn Urðarbrunni, Völuspá 19). She and her sisters lay down laws, and chose the fate of the children of men, (þær lög lögðu, þær líf kuru alda börnum, Völuspá 20). They are present at the birth of kings, determining in advance what lands they will hold in life, and perhaps even their fortunes in war (Helgakvida Hundingsbana I, 2-4). She employs unbreakable bonds which hold men fast to the course she lays out for them, even against their will (Gróagaldur 7). “No one can refute Urd’s decree even if it incurs blame,’ (Urðar orði kveðr engi maðr, þótt þat sé við löst lagit, Fjölsvinnsmál 47). The gods themselves are subject to fate. Although Odin knows his destiny, he is powerless to change it. Fate is the provenance of the Norns alone. The Æsir hold a tribunal near Urd's well every day, but they do not have total jurisdiction over men's fate, not even on the battlefield. 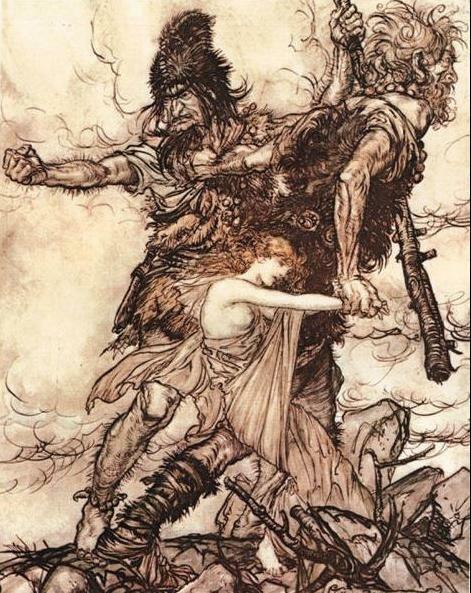 Remarkably, the youngest Norn, Skuld, is the foremost of the Valkyries (Skuld ina þriðju, Voluspá 20; compare Sá hon valkyrjur vítt of komnar, ...Skuld helt skildi, Völuspá 30). In Fjölsvinnsmal 20, the world-tree is called Mimameiðr, Mimir’s Tree. Mimir is so powerful that to gain power, Odin, the ruler of the gods willingly hangs on the world-tree for nine days and nights with no food or drink (Hávamál 138-139) to obtain a single draught of the precious mead in Mimir’s well (ek drykk of gat ins dýra mjaðar, Hávamál 140); Only then does Odin “quicken and begin to flourish, grow and thrive” (Þá nam ek frævask ok fróðr vera ok vaxa ok vel hafask, Hávamál 141). In addition, Odin pledges one of his eyes to Mimir, who keeps it in his well (Allt veit ek, Óðinn, hvar þú auga falt, í inum mæra Mímisbrunni, Völuspá 28). Yet, what Odin sacrifices to get a single drink of, Mimir has in abundance. Every morning Mimir drinks the same mead from Odin’s pledge (Drekkr mjöð Mímir morgun hverjan af veði Valföðrs, Völuspá 28). Mimir is well-known as a keeper of treasures. As we have seen, the expression hodd goða (hoard of the gods) in Grímnismál 27 most likely refers to his grove, Hoddmimis holt. In spite of its great value, the gods never challenge Mimir’s authority over this well, even after Mimir is murdered. Instead, Odin embalms his head, and uses it as an oracle (sagði honum marga leynda hluti, Ynglingasaga 4). Even in this state, Mimir retains control over his well and keeps Odin’s confidence until the day Odin himself dies. Just before Ragnarök, as Heimdall blows his horn to commence the battle, Odin consults Mimir’s head one last time (mælir Óðinn við Míms höfuð; Völuspá 46). And, worthy of remark, the two human beings who survive the final battle to repopulate the new earth are hidden there in Hoddmimis Holt, Hoard-Mimir’s grove (Vafþrúðnismál 45). The primeval giant, Ymir, from whose corpse Odin and his brothers created earth and heaven, rises from rivers flowing out of Hvergelmir in the earliest days. He and the cow Audhumbla are the oldest living creatures. Thus, Ymir is older than Mimir. Since Mimir acts as Odin's mentor, he is no doubt older than Odin. According to Snorri, Odin and his brothers are born in the third generation of beings. Thus Mimir likely belongs to the second generation. Since Midgard was formed from Ymir’s corpse, and the heavens from his skull, are we to believe that Urd and Mimir, who Snorri tells us live in heaven and in Jötunheim respectively, had to wait until the gods formed the upper worlds before establishing their homes and their dominion over their own wells? That, of course, is the logical result of accepting a vertical orientation of the three roots and the wells which support them. In a vertical arrangement, Urd and Mimir could not have taken control of their wells, until the places they are supposedly located were created by the younger gods. Such a belief seems incredible in light of Hávamál 138-141 which suggests that only after a drink from Mimir’s fountain did Odin begin to blossom and grow, thrive and become wise. Could Odin have fashioned Midgard, Asgard and all the wonders therein before obtaining such power? Certainly not. Odin had to submit to Mimir before tasting one drop from his precious well. Therefore the well must have belonged to Mimir since Odin was young. Thus, logic dictates that the roots and the wells must be located in the oldest layers of the world, and that their ownership was established long, before Ymir was slain. Not surprisingly, this conclusion is in agreement with Snorri’s statements that the three wells are located in the north, the south and 'where Ginnungagap once was'— the same places as the world of ice in the north, the world of fire in the south and the empty abyss, which Snorri says laid between them in his account of creation in the opening chapters of Gylfaginning. Thus, it seems we can detect the authentic heathen worldview in Snorri's statements, even though it has been overlaid by Roman Catholic ideas concerning the nature of the cosmos as a three-tiered system containing heaven, earth and hell. This arrangement finds support throughout the Poetic Edda. For additional evidence, see Old Norse Cosmology drawn from passages in the Poetic Edda. Since Grímnismál 29-30 inform us that the Bifröst bridge connects the home of the gods with Urd’s well, and the heathen poet Egil Skalagrimsson assures us that the home of the gods (Góðheim) is located in the sky, logically we must look for Urd’s well somewhere below. It must also be a great distance from Asgard since the gods ride their horses to arrive there, and because such horses, who can otherwise fly, must ‘swim’ in the atmospheric sea if this bridge is inaccessible (Fafnismál 15, Grímnismál 21). In addition, Grímnismál 29, read in conjunction with Grímnismál 27-28, suggests that Thor must wade through four subterreanean rivers to arrive there. All this suggests that Urd's well is, in fact, located in Hel. In Gylfaginning 15, Snorri informs us that the Bifröst bridge is seen by men as the rainbow. From a vantage point on the surface of the earth, a rainbow appears to extend from somewhere beyond the horizon upwards into the sky. 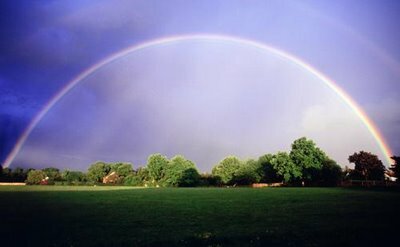 At times, a rainbow appears as a half-arc, while at other times, it appears as a full arch extending over the horizon in opposite directions. If Bifröst is indeed a rainbow, we can reasonably conclude that the genuine heathen conception placed Asgard at its apex in heaven, and Urd's well somewhere beyond the southern horizon. If seen as a full arch, the twin bridgeheads of Bifröst thus find their foundations on the surface of the lower world, which is more expansive than the earth in all directions. Since Urd's well is located in the south and Niflheim is located in the north, it stands to reason that the second bridgehead would be located there. If so, this must be the side watched over by Heimdall, in order to prevent hostile giants from ascending the bridge to heaven. In Grímnismál 20, the great foundation upon which Bifröst is built, is called Jörmungrund, the great ground. This land mass encompasses both Hel and Niflheim/Niflhel. Odin, who can survey all of Midgard and the sea from his celestial vantage point sitting on his throne Hildskjalf apparently cannot see what lies below (cp. Skrínismál prose introduction, Grímnismál prose introduction, etc). This is because Midgard blocks his view of the lower world; thus he sends his ravens Hugin and Munin to spy there and report what they see. Since he cannot follow their motions in the land of the dead, he worries about their well-being. As an aside, Hugin and Munin, 'Thought' and 'Memory', are conceptually related to the name Mimir, 'Memory', who makes his home in the same regions, beneath the central point of the Tree. The poetic sources tell us that warriors, who have fallen on the battlefields of Midgard and who are destined for Valhall, arrive there over Bifröst. Even this does not contradict placing Bifröst's bridgeheads in the underworld. The fallen do not ascend directly to heaven. In the sources, they first pass through Hel. Fafnismál 10 informs us that “at some time, all men will travel hence to Hel” (því at einu sinni skal alda hverr fara til heljar heðan). Warriors are no exception. Gisli Surrson’s Saga chapter 24, expressly states that even those men destined for Valhall are bound with hel-shoes like all the rest (binda mönnum helskó þá er þeir skulu ganga á til Valhallar). The purpose of these shoes is no doubt to walk the road to Hel. In Atlamál in grænlenzku, warriors who fall in open combat likewise are sent to Hel. In Egil’s saga ch. 45, three members of King Erik Blood-axe’s retinue are attacked and die in open combat. In a verse accompanying the text, Egil, their attacker, himself a heathen skald, recites a verse which says that they “have gone to Hel’s high hall” (til hásalar Heljar helgengnir). While none of these warriors died in a formal battle, there is ample evidence that the case was the same for those who did. In Gylfaginning 49, when Hermod rides to Hel on Frigg’s behalf to get news of her son Baldur, the guardian of the bridge spanning the river Gjöll remarks that the din he makes is more than that of five fylki of men who passed the previous day. Those men together made less noise than he. 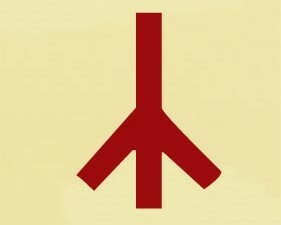 Fylki are military divisions, leaving no doubt that the men who had come before Hermod had died together in battle. They too traveled to Hel with their companions. These men may be associated with Baldur. In Saxo’s tale of Baldur’s death (Danish History, Book 3), Baldur himself is a military leader who dies in battle with Hotherus (Höðr). á hann sjalfan at séa. We know that they will arrive in Valhall over Bifröst which definitely forms a path through the sky. In Erikirsmál, a large number of men have who died together in battle arrive in Valhal. Foremost among them is King Erik who arrives at the head of a great host consisting of five kings and their followers. Upon their approach, the benches in Valhall tremble and the whole building quakes. This tells us that the road they ride on was conceived of as a solid pathway firmly connected to the foundation of Asgard. Vibrations on the bridge cause Valhall itself to shake. The noise this approaching host makes is so great, Bragi wonders aloud if Baldur himself has returned. After his death, we know that Baldur resides in Hel. The logical conclusion is that the bridge King Erik and his men now arrive on (i.e. Bifröst, the “trembling way”) has its apex in heaven and at least one of its bridgeheads in Hel. If so, then Hel must contain the “green realms of the gods” that Göndul and Skögul pass through on their way back to Valhall. This should come as no surprise. As we have seen, a bridgehead of Bifröst is found near Urd’s well, where they can ascend to Asgard, their charges in tow. This is the same span that the gods ride over “every day to sit in judgment by Urd’s well.” Hel is often characterized as green. In Saxo’s Danish History (Book 1), when the hero Hadding, a favorite of Odin, is taken on a tour of the underworld, “to the regions whither he must go when he died.” He and his companion travel “along a path that was worn away with long thoroughfaring.” In this region “fresh herbs grow in winter.” Hadding also encounters a group of warriors there. While Hadding was sojourning with her a marvellous portent befell him. While he was at supper, a woman bearing hemlocks was seen to raise her head beside the brazier, and, stretching out the lap of her robe, seemed to ask, "in what part of the world such fresh herbs had grown in winter?" The king desired to know; and, wrapping him in her mantle, she drew him with her underground, and vanished. I take it that the nether gods purposed that he should pay a visit in the flesh to the regions whither he must go when he died. So they first pierced through a certain dark misty cloud, and then advancing along a path that was worn away with long thoroughfaring, they beheld certain men wearing rich robes, and nobles clad in purple; these passed, they at last approached sunny regions which produced the herbs the woman had brought away. Going further, they came on a swift and tumbling river of leaden waters, whirling down on its rapid current divers sorts of missiles, and likewise made passable by a bridge. When they had crossed this, they beheld two armies encountering one another with might and main. And when Hadding inquired of the woman about their estate: "These," she said, "are they who, having been slain by the sword, declare the manner of their death by a continual rehearsal, and enact the deeds of their past life in a living spectacle." In archeological finds, warriors were buried with their weapons and war-gear. Such graves often contain horses, and sometimes even wagons, no doubt necessary for the long journey to Hel. The fallen first ride to Hel, then over Bifröst. Nowhere are fallen warriors said to fly through the air to Valhall (see Peter Shenk's To Valhalla by Horseback? p. 78, 5.2). In Grímnismál 21, the currents of this river are said to be too strong for them to wade. Eyvind, the poet responsible for Hakonarmál, distinguishes between the ‘blue’ sea and the ‘green realm of the gods’. The comparison between the sky and the sea is a natural one. Both are blue in color. Billowing white clouds drift across the sky on the winds like white-capped waves roll across the sea. Water falls in torrents from the sky periodically, as if the sky itself were filled with water. In mythological terms, the horses of the gods must ‘swim’ in the ether, when a solid bridge is not otherwise available for them to fjörd (Fafnismál 15). In this event, the gods have a ship available for their use. In Gylfaginning 4, the ship Skidbladnir is said to be large enough to carry all the gods and their war-gear. Since Bifröst breaks when Surt's men attempt to ride over it as the battle of Ragnarök commences, it is entirely possible that the gods arrive at the scene of the final battle by ship, just as the giants on Naglfar, the ship of nails, do. Despite this, warriors who are burnt on their vessels do not arrive in Valhall by ship. Funeral ships transport their cargo to Hel. When Baldur is burnt on his ship Hringhorn along with the ring Draupnir, Hermod later finds him in Hel. As proof Baldur was physically transported to Hel, Hermod returns the ring Draupnir to Odin, demonstrating that even those burnt at sea arrive in Hel along with the possessions they carry. In Völuspá 36, we are told that the lower world has beachheads called Naströnds (corpse-shores) and in Saxo Book 8, an adventurer arrives there by ship. Since warriors destined for Valhall go to Hel, and afterward ride to Valhall over Bifröst, we have independent confirmation that at least one of its bridgeheads is located in the lower world. This is most likely the bridgehead located “south At Urd’s well” where the gods gather daily to sit in judgement. A full rainbow appears to have two ends, set in opposite directions. Since Odin is said to ride Sleipnir “to Niflhel” in Baldrs Draumr 2, we have good reason to place the other bridgehead there. Thus Bifröst has two bridgeheads, one in the south, in Hel, and one in the north, in Niflhel. The southern span appears to be the one the gods on their horses ride across daily. It is too delicate for Thor’s fiery chariot to bear. When Surt leading his men rides "from the south", carrying "the bane of branches" in a bold attempt to ascend to heaven, then the bridge will break, just as it would if Thor had driven his chariot across it. The northern bridgehead, on the other hand, is most likely the one watched over by Heimdall, lest the frost-giants attempt to storm the ramparts of heaven. It extends to Niflheim, the cold world of the ancient Hrim-þursar, those giants who are hostile to the gods. 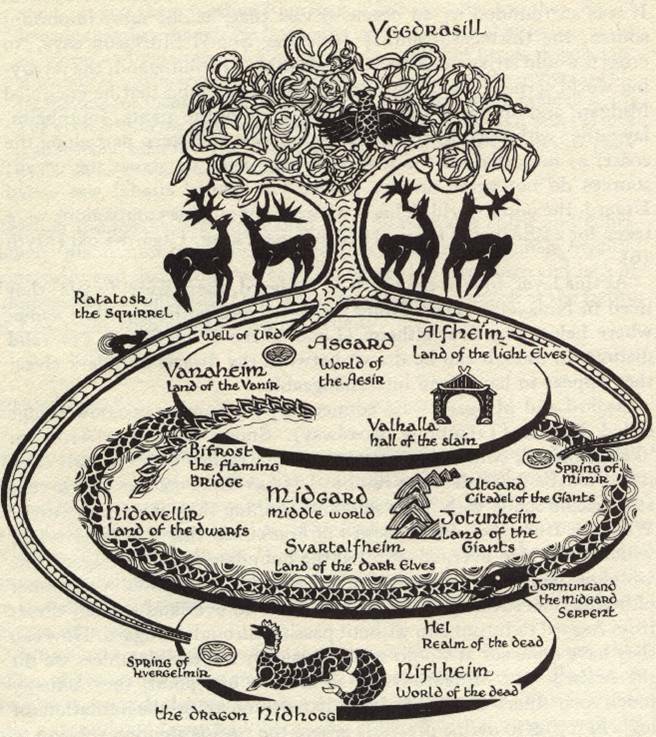 The position of the three roots and wells of Yggdrasil in the lower world, along a horizontal line running from north to the south, also helps us understand the mechanics of Ragnarök. When Surt and his men come riding from the deep south, Bifröst breaks. A poetic verse preserved in Skáldskaparmál, designates their home as Surts sökkdalir, 'Surt's deep-dales.' According to Völuspá, Surt wields the 'bane of branches', a metaphor for fire. With this sword, he sets the whole world ablaze. Flames play against heaven itself, the sky cracks and the burnt crust of the earth sinks into the sea. Nothing on land or in the air could survive this conflagration. Yet, when the flames die out, a new world rises from the sea. It is lush and green. On it, fields yield grain unsown, and an eagle flies above, catching fish in a stream. The new world thus must be the lower world risen. As proof of this, the surviving gods again find the golden chessmen that the Æsir played with in the earliest days. There, we find Lif and Lifthrasir, who were once hidden in Hoard-Mimir's grove (Vafþrúðnismál 45). Baldur and Höður, who previously resided in Hel's high hall, return as does Hoenir, the god sent by the Æsir, along with Mimir, as a hostage to the Vanir. And last, but not least, the dragon Niddhögg, who gnaws at the northen root of the world-tree near his home in Hvergelmir, is seen there. The new world is thus the lower world risen— the oldest layer of creation, the foundation upon which everything else is built, is all that remains.